Following the news that alleged Holocaust Museum shooter James Von Brunn had attended meetings of the “American Friends of the British National Party,” Harry’s Place did some digging and discovered the archived copy of the AFBNP website. It’s as bad as you could imagine, with links to some of the worst white supremacist sites on the web: Stormfront, the Council of Conservative Citizens, the Institute for Historical Review (a Holocaust denial outfit), American Renaissance, and of course, David Duke. Even more interesting, the American Friends of the British National Party also published a magazine called “Heritage and Destiny,” and the January/February 2001 edition is archived (PDF). Spearheaded by the AFBNP, white nationalists around the country pursued a loosely coordinated plan to nominate Buchanan and turn his campaign towards explicit racial nationalism. AFBNP members had attended at least two Buchanan fundraising events, the first as early as December 1999. Reform Party leaders from Florida and Virginia spoke at AFBNP meetings in February and March. Mark Cotterill and several other racists volunteered at the Virginia Reform Party offices. Also involved in the Buchanan campaign were the racist, yet pseudo-mainstream Council of Conservative Citizens and the explicitly revolutionary neo-Nazi National Alliance. An open connection between these groups would have been highly unlikely but for their common ties to Mark Cotterill and the AFBNP. Overall, white racists were deeply involved in the Reform Party in California, Florida, Illinois, North Carolina, South Carolina, and Virginia. Yet an explicitly racist Reform Party was not to be. Buchanan’s campaign threw out Cotterill and other racist volunteers after their presence was exposed by the Center for New Community and other groups. 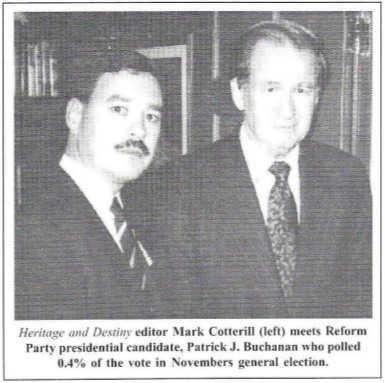 “Buchanan is now part of the problem, and not part of the solution,” Cotterill wrote in the next issue of Heritage and Destiny. “The whole notion of trying to infiltrate someone else’s movement and hijack it was a bad idea, as the Buchanan/Reform Party case proved.